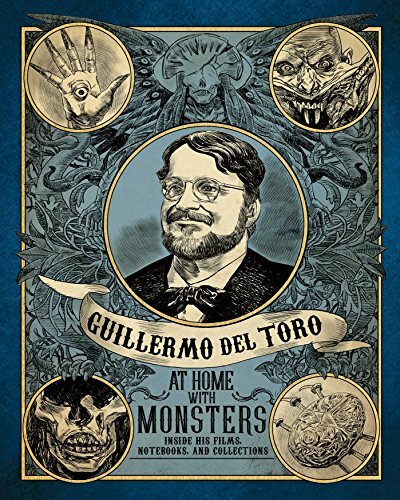 When I saw this book being listed, I wondered why there's a need for another book on Guillermo del Toro's house, art and collection when there's already a book on this topic that was published in 2013 called Guillermo del Toro Cabinet of Curiosities: My Notebooks, Collections, and Other Obsessions. Well, this is actually the companion book for the exhibition at Los Angeles County Museum of Art (1 August - 27 November 2016). If you have the earlier book, then there's going to be a lot of duplication. There are some new photos and unseen concept art but I'm not sure whether or not it's wise to spend money to buy this book when majority of the content is the same, and not just that as the earlier book has a lot more content. The book talks about Guillermo del Toro's habit of collecting, his Bleak House where he keeps all his stuff, film making sensibilities, and inspiration. The most interesting to read is about the things he collects and this guy is into collecting a lot of weird but cool stuff. I've not been to the exhibition though, so I can't say whether or not all the photos of sketchbooks, artifacts, drawings, film stills in this book are the same as those shown at the exhibition. This book would probably make a good remembrance for the exhibition. If you're a huge fan of Guillermo del Toro and need to collect everything about him, go ahead get this book. If you just want one book on Guillermo del Toro, then get the earlier, larger and thicker book.